Also, a nifty feature in the Chicago Tribune where a reader reviews The Hole We’re In. *I assume this may be a reference to a different quote that was in Martin Amis’s memoir, Experience. 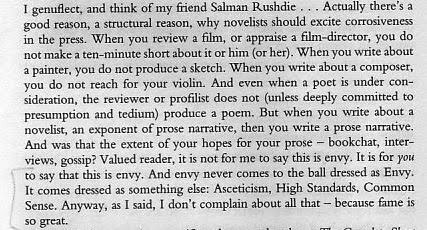 Graphic dentistry passages notwithstanding, Experience is one of my favorite books about writing. The pencil mark is someone else’s and should be ignored. I had scanned this quote years ago to e-mail to a despondent writer friend, which is why I happen to have it around.